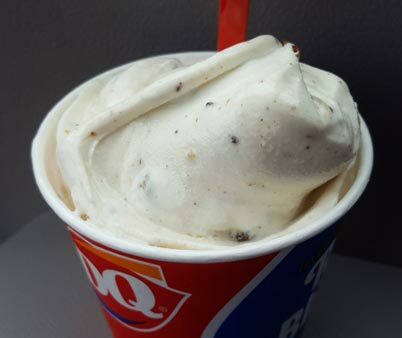 [New for late April 2017] Dairy Queen decided to release the May blizzard of the month a little early and to my pleasant surprise, my local DQ is advertising it. Break time! I will admit that my brain is 97% focused on the "brookie" part and not much else. Just like 2015's Chris Pratt related blizzard, I half expect this one to continue on all summer long as the more aptly named Brookie Blizzard (but only time will tell). I take my first bite and it doesn't go well because I'm annoyed at how prevalent the caramel flavoring is. There's too much of it and it tastes more cheap than anything else. It's not horrible, but it's not some deep, rich, buttery caramel. It's cheap caramel and there is too much of it. I poke around and try a brookie piece here and there but the caramel is completely overriding their flavor. I simply do not get this blizzard. Why waste all this time making brookie bits if you don't take the time to let them shine? This could have been amazing with some kind of brown sugar swirl to bring out their flavor but instead I'm getting the texture without the flavor. Booooooooooo. I wind up taking a 10-15 minute break from my blizzard to do some quick can recycling on the way back to the office. 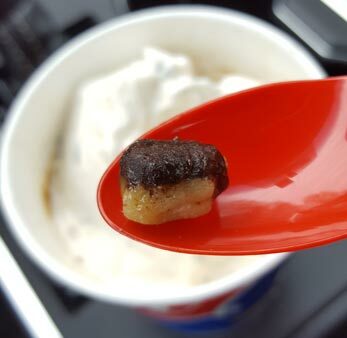 (pro-tip: stir the blizzard every few minutes to keep the consistency similar and avoid spots getting too melted). My first big scoop is one with three brookie bits in it and it's somewhat amusing. A few more scoops and then I get a scoop with two bits in it. With the caramel somewhat lessened and the brookie flavor amped, yeah, it's more enjoyable now. On the odd chance I get this again, I'm totally skipping the caramel next time. I'm glad I read this review. It looked really good. I still want to try it. I might see if I can either just leave out the caramel or swap hot fudge for it. Generally they are good with making changes...although sometimes they charge for those changes/additions. I have never understood an extra fifty cents for whipped cream. WHAT? Ugggg, that's just wrong. whipped cream should be free! I always thought the 50 cents was for an extra scoop of mix-ins! Hot fudge sounds tempting (and an instragram user threw out peanut butter as an idea). Whatever you try, let us know how it goes. I agree completely with you on this. I expected to love it but was very disappointed. I guess it all depends on the location. 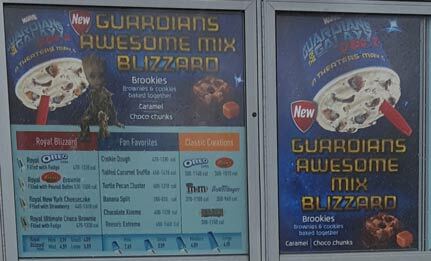 There's one here in Houston that makes an exceptional GAM Blizzard. The chunks of brookie & chocolate are spread throughout & the caramel is at a nice balance; it's not overwhelming at all. It's actually made me stop by this location at least 3-4 times a week all month long.